Breakdown: The Stars decision to pull the goalie with 7+ minutes left - The Point Data-driven hockey storytelling that gets right to the point. With 7:48 to go in the 3rd period and a face-off in Ottawa’s end, Dallas, trailing 3-1, pulled Ben Bishop for an extra attacker. That’s…..unusual. It’s rare to see a coach pull a goalie with less than 2 minutes to play no matter the game state. However, there’s been plenty of talk recently about the optimal time to pull a goalie depending on how many goals you need to score to tie the game. Some research suggests if you’re down a pair of goals, 7 minutes is the optimal time to get an extra skater on the ice. So, there’s evidence to suggest that Jim Montgomery made the right call in this situation. Unfortunately for Monty, his players failed to create a single quality look on net. The Stars attempted 11 shots with the extra attacker on the ice in the 3rd period. However, not a single attempt came from the slot. 8 Dallas attempts hit the net but they were all from the perimeter as the Stars failed to score in 4:07 with an extra skater on the ice. Because of all the low percentage shots, the Stars expected goals number in this time was 0.4. 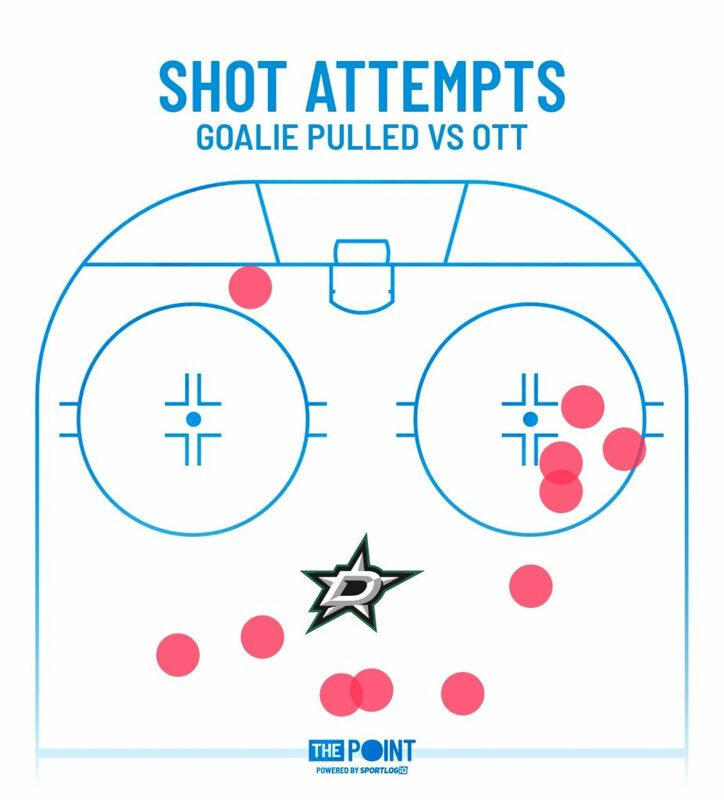 What this means is that based on the quality of the shots the Stars created, Dallas would have had to play 10:16 to reach an expected goal total of 1. The strategy deployed by Monty is an interesting one and whether it was successful or not last night depends on how you look at it. In terms of creating zone time and sustained pressure, yes – it was a success. 3:25 of the 4:07 with the goalie pulled was played in Ottawa’s end and the shot attempts were 11-1 in Dallas’ favor. “I thought the pulled goalie situation actually worked, we just didn’t score like the rest of the night,” Monty said. However, if you’re not getting pucks into the middle of the ice and getting the goalie to move laterally, it’s going to be difficult to score. Deflections and odd-man rebound chances can occur on perimeter shots but they are lower percentage plays than creating shots from inside the dots, below the circle – as mentioned, something Dallas failed to do once in 4+ minutes. “I just didn’t think we were getting in front of their goalie enough. They did a really good of collapsing, being in shot lanes,” Monty continued. So, in a way pulling the goalie with 7+ minutes left was a success for the Stars in how much zone time they created and how many shot attempts they produced. However, they failed to create attempts from the areas that matter most in the offensive zone, something that is more difficult at 6 on 5 than 5 on 4 or 4 on 3. The more guys on the ice, the more bodies to get pucks around. 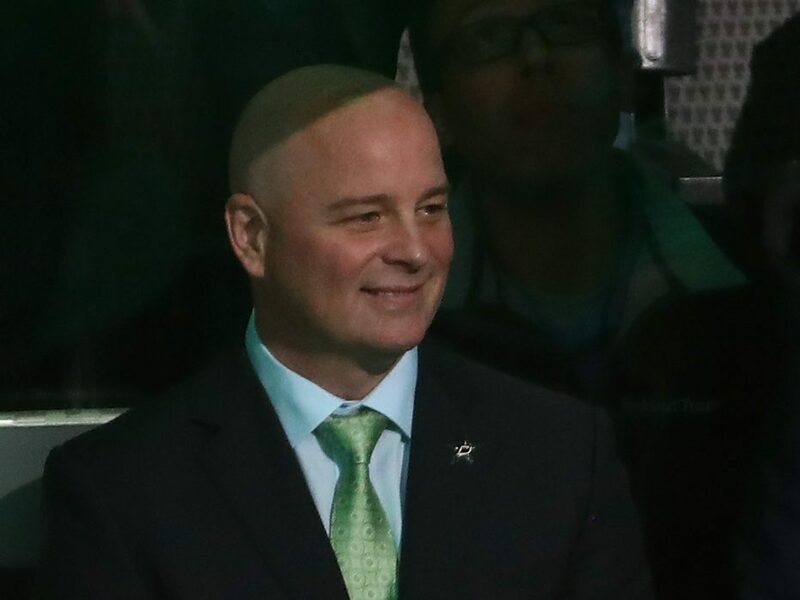 It will be interesting to see if the Stars continue with this approach and if so, how they will game plan to create better opportunities to score at 6 on 5.